Metrology, R-test, five-axis machine tools, calibration, location error, error motion, geometric error. The R-test measures the three-dimensional displacement of a precision sphere, attached to a machine spindle, by using three displacement sensors fixed to the machine’s table. Its application to error calibration for five-axis machine tools has long been studied. This paper presents software for analyzing the measured R-test trajectories for error diagnosis and numerical compensation for rotary axis location errors and error motions. The developed software first graphically presents the measured R-test trajectories to help a user intuitively understand error motions of the rotary axes. It also numerically parameterizes the rotary axis geometric error parameters, and then generates a compensation table that can be implemented in some latest-generation commercial CNC systems. An actual demonstration of its application to a five-axis machine tool with a universal head (two rotary axes on the spindle side) is presented. S. Ibaraki, Y. Nagai, H. Otsubo, Y. Sakai, S. Morimoto, and Y. Miyazaki, “R-Test Analysis Software for Error Calibration of Five-Axis Machine Tools – Application to a Five-Axis Machine Tool with Two Rotary Axes on the Tool Side –,” Int. J. Automation Technol., Vol.9, No.4, pp. 387-395, 2015. H. Schwenke, W. Knapp, H. Haitjema, A. Weckenmann, R. Schmitt, and F. Delbressine, “Geometric error measurement and compensation of machines – An update,” Annals of CIRP – Manufacturing Technology, Vol.57, No.2, pp. 560-575, 2008. S. Ibaraki and W. Knapp, “Indirect Measurement of Volumetric Accuracy for Three-axis and Five-axis Machine Tools: A Review,” International Journal of Automation Technology, Vol.6, No.2, pp. 110-124, 2012. 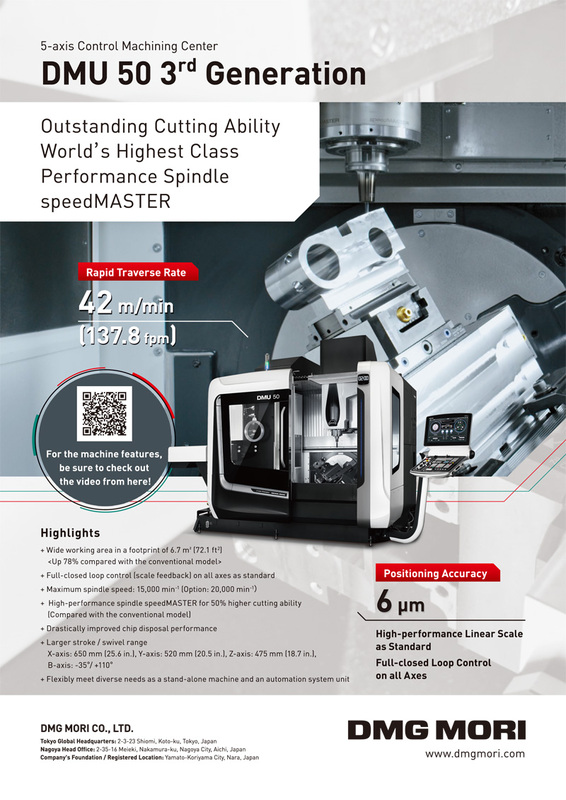 Y. Kakino, Y. Ihara, H. Sato, and H. Otsubo, “A Study on the motion accuracy of NC machine tools (7th report) – Measurement of motion accuracy of 5-axis machine by DBB tests –.” Journal of Japan Society for Precision Engineering, Vol.60, No.5, pp. 718-723, 1994 (in Japanese). M. Tsutsumi and A. Saito, “Identification and compensation of systematic deviations particular to 5-axis machining centers,” International Journal of Machine Tools and Manufacture, Vol.43, No.8, pp. 771-780, 2003. Y. Ihara, “Ball Bar Measurement on Machine Tools with Rotary Axes,” International Journal of Automation Technology, Vol.6, No.2, pp. 180-187, 2012. G. H. U. Florussen and H. A. M. Spaan, “Static R-Test: Allocating the Centreline of Rotary Axes of Machine Tools,” Proc. of the 8th Lamdamap Conference, pp. 196-202, 2007. S. Weikert, “R-Test, a New Device for Accuracy Measurements on Five Axis Machine Tools,” Annals of CIRP – Manufacturing Technology, Vol.53, No.1, pp. 429-432, 2004. B. Bringmann and W. Knapp, “Model-based ‘Chase-the-Ball’ calibration of a 5-axis machining center,” Annals of CIRP – Manufacturing Technology, Vol.55, No.1, pp. 531-534, 2006. S. H. H. Zargarbashi and J. R. R. Mayer, “Single setup estimation of a five axis machine tool eight link errors by programmed end point constraint and on the fly measurement with Capball sensors,” International Journal of Machine Tools and Manufacture, Vol.49, pp. 759-766, 2009. W. T. Lei and Y. Y. Hsu, “Accuracy test of five-axis CNC machine tool with 3D probe-ball. Part I: design and modeling,” International Journal of Machine Tools and Manufacture, Vol.42, No.10, pp. 1153-1162, 2002. Y. Ihara and Y. Hiramatsu, “Design of Motion Accuracy Measurement Device for NC Machine Tools with Three Displacement Sensors,” International Journal of Automation Technology, Vol.5, No.6, pp. 847-854, 2011. S. Ibaraki and Y. Ota, “Error Calibration for Five-Axis Machine Tools by On-the-Machine Measurement Using a Touch-Trigger Probe,” International Journal of Automation Technology, Vol. 8, No.1, pp. 20-27, 2014. C. Hong, S. Ibaraki, and A. Matsubara, “Influence of position-dependent geometric errors of rotary axes on a machining test of cone frustum by five-axis machine tools,” Precision Engineering, Vol.35, No.1, pp. 1-11, 2011. S. Ibaraki, C. Oyama, and H. Otsubo, “Construction of an error map of rotary axes on a five-axis machining center by static R-test,” International Journal of Machine Tools and Manufacture, Vol.51, No.3, pp. 190-200. 2011. C. Hong and S. Ibaraki, “Observation of Thermal Influence on Error Motions of Rotary Axes on a Five-Axis Machine Tool by Static R-Test,” International Journal of Automation Technology, Vol. 6, No.2, pp. 196-204, 2012. C. Hong and S. Ibaraki, “Graphical presentation of error motions of rotary axes on a five-axis machine tool by static R-test with separating the influence of squareness errors of linear axes,” International Journal of Machine Tools and Manufacture, Vol.59, pp. 24-33, 2012. I. Inasaki, K. Kishinami, S. Sakamoto, N. Sugimura, Y. Takeuchi, and F. Tanaka, “Shaper generation theory of machine tools – its basis and applications,” Yokendo, Tokyo, 1997 (in Japanese). T. Otsuki, “Compensation technologies for machine tool volumetric errors,” Proc. of Technical Committee of Ultra Precision Positioning, Vol.2012-1, pp. 27-38, 2012 (in Japanese).